St. Simons real estateÂ may be more than 5,000-miles away from Italy as the seagull flies but that doesn’t mean island residents donâ€™t love a good bowl of fresh, handmade pasta and a bottle of Italian vino. For firsthand proof, why not make plans to attend the upcoming, near month long, Italian Festival? Billed as the Festival dell â€˜Arte, itâ€™s being put on by the Glynn Art Association from September 3rd until the 27th. During the course of the festival, attendees will have ample opportunities to enjoy Italian art. However, on the showâ€™s opening night, they’ll also get to enjoy much more than that. On the list of opening night delights are Italian cuisine, wine and opera. The antipasto is expected to be out of this world. 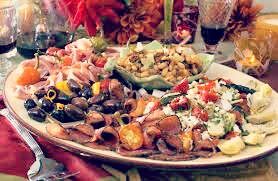 For those that have never experienced it before, it typically includes marinated or pickled vegetables, artisan cheeses, thinly sliced meats, rustic breads, dipping oils and an assortment of brined olives. Italians have been incorporating such appetizers into the menus for centuries. Word has yet to be released as to which operas and Italian wines will be highlighted during the opening night celebration. So all we can say for certain is that with 20 different wine regions to Italyâ€™s credit, the eventâ€™s organizers certainly have quite a few options to choose from. Perhaps it will be a Cabernet Sauvignon from Tuscany, a Chardonnay from Lombardy or Pinot Grigio from Molise. Weâ€™ll all have to just wait and see. The Italian Festival isn’t the only place where St. Simons real estate owners may enjoy pasta el dente and fine wines on the island. There are Italian eateries like Tramici, CJâ€™s, Nazzaroâ€™s, Salâ€™s and Joeâ€™s too. To learn more about what St. Simons real estate has to offer fans of Italian cuisine and culture, please contact us.